Peru welcomed the 41st edition of the Dakar that finished today in Lima after 10 punishing stages, the outcome of which was victory for a heroic Toby Price in the bike race, Nasser Al-Attiyah with his third title in the car category thanks to his exemplary strategic poise, Nicolás Cavigliassoun precedentedly dominating the quad category, Francisco “Chaleco” López succeeding in his comeback and conversion after six years of absence with a win in the SxS race and Eduard Nikolaev picking up his fourth title in the truck race. One single duo managed to avoid all the pitfalls, find the balance between performance and driving safely and grasp all the subtleties of the navigation to which they were subjected. 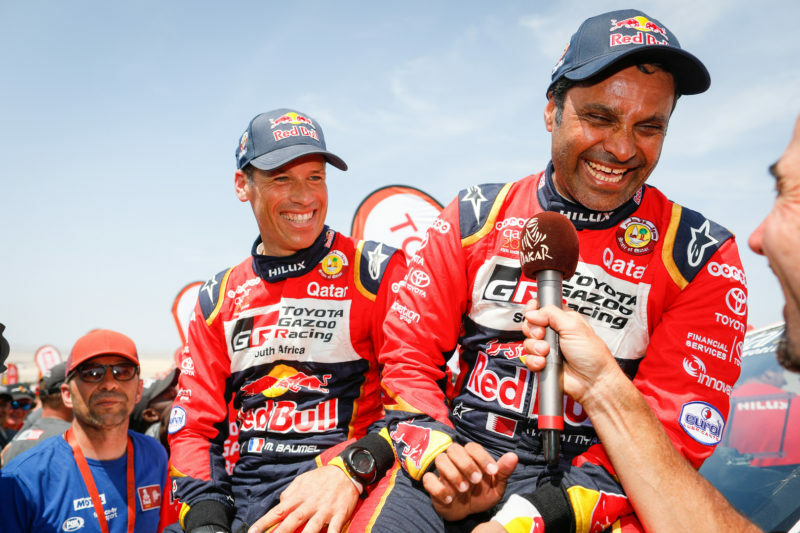 It was the crew made up of Nasser Al-Attiyah behind the wheel and Mathieu Baumel as co-pilot. 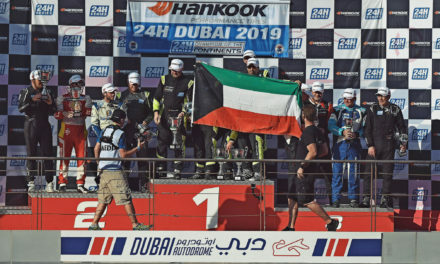 On completion of the ten stages, three of which he won, the Qatari driver also won the Dakar for the third time, thanks to a carefully crafted scenario and a superb understanding of strategy. One by one, the “Prince of the desert” distanced his direct rivals, striking a big blow on his adversaries on the Super Ica stage (stage 8), where he took care to start a considerable distance behind his rivals. Always in control, the boss of the race observed his pursuers do battle in the dunes, whether it was Stéphane Peterhansel, Sébastien Loeb or Nani Roma, before setting the historical record straight in Lima. Toyota, the constructor which has most probably entered the largest number of vehicles in the history of the Dakar, won the car category for the first time to reward the efforts of Team Overdrive, which had previously been prevented from reaching the top step on the podium by the Peugeots or the Minis, firstly with Giniel de Villiers or also last year with Al-Attiyah. As for the X-Raid team, in the end, the 4×4 Mini achieved the firm’s best results, with Nani Roma in 2nd position and Jakub Przygonski again stepping up a notch in the hierarchy by climbing to 4th place. The challenge to win for Sébastien Loeb genuinely seemed possible in light of the gaps that he was capable of opening up when everything was running smoothly. However, navigational mistakes and mechanical problems put paid to his hopes for victory. He finished the rally with four extra stage wins on his roll of honour and another place on the final podium (3rd). A battle well and truly took place in the Side by Side category, which swelled threefold in number in 2019 (with 30 crews at the start), thanks to the arrival of prestigious competitors, such as former biker Francisco López, who had previously failed to conquer the title on two wheels (3rd in 2010 and in 2013) but did not let the chance slip through his fingers for his first participation in the SxS category. After a discrete start to the rally, “Chaleco” put on an imperial display ahead of title holder Reinaldo Varela and former biker Gerard Farrés (3rd in 2017), while Sergey Karyakin, Casey Currie or Ignacio Casale had already lost a lot of ground. 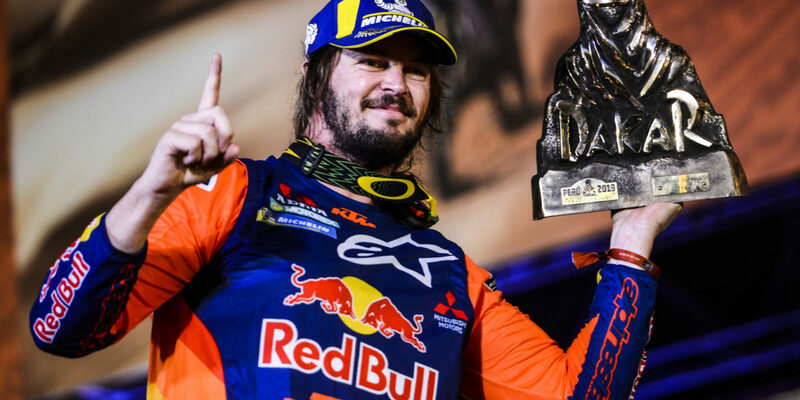 The most successful comeback kid on the Dakar 2019, with three stage victories to add to his already impressive roll of honour (11 specials on a bike),“Chaleco” nailed Chile’s colours even further on to the mast of the rally, with a triumph that follows on from countryman IgnacioCasale’s two successes in the quad race (in 2014 and 2018). The race was soon dominated by Argentinean Nicolás Gavigliasso. It would be euphemistic to say that the rider from Córdoba sailed through this edition of the Dakar because he quite simply won nine out of ten stages on the 2019 edition, an unprecedented feat in the history of the most famous rally-raid, for all of the categories put together. What’s more, at the age of 27 years old, the Yamaha rider was only taking part in his second Dakar this year. “It wasn’t easy,” declared Nico at the finish to the last stage. “I worked hard before this Dakar. It’s only my second Dakar, but I kept pushing, I wanted to finish in front. Now I’m number one in the quad race and I’m so, so happy”. Jeremías González Ferioli, second in the general standings 1 hour 55 minutes behind the winner, was Cavigliasso’ssole rival who managed to win a special, on the third stage. Taking part in his fourth Dakar, the young 23-year old rider from Córdoba was not able to put his countryman under pressure. Behind the two Argentineans, Frenchman Alexandre Giroud finished on the third step of the podium. Starting like a canon ball with two stage victories to commence his defence of the title on the Dakar, in the end Eduard Nikoalev had somewhat of a fright. Although it was thought that the Kamaz driver would again be untouchable, the Russian was put under serious pressure by his rivals, in particular his team-mates Andrey Karginov and Dmitry Sotnikov, to such an extent that he lost the lead of the rally to Sotnikov two days from the finish. 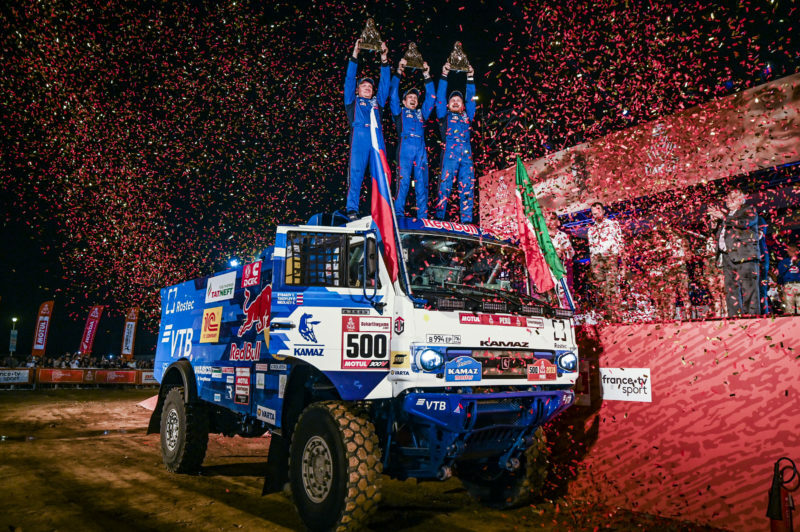 However, the three-time winner of the event finally reacted flawlessly with a splendid victory on stage 9 to regain the lead and drive his truck onto the highest step of the podium in Lima, for the fourth time. 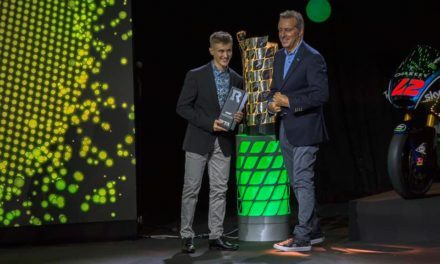 Sotnikov will therefore have to wait another year to hope to obtain his holy grail, a success which Gerard de Rooy, on the third step of the podium, has tasted twice. 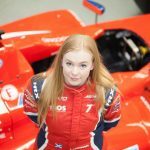 The Iveco driver was expected to be the main rival of the Kamaz team, but finally he was never a genuine threat. “It’s very crazy to sit here and say that we won the Dakar rally with no stage victories until today. It’s really crazy. I’m over the moon, I’m so damned stoked. It’s been a long 10 days. Now I’ll just wait and see what damage I’ve done to my wrist. At the end of the day, the pain and torture has been worth it. I thought I would only be able to do two stages and then pull out and that would have been me done, but the support from everyone back home in Australia and then having some things go my way and a bit of luck, it just worked out in the end. It’s been an unreal rally. 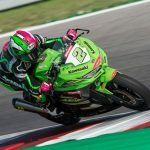 [On the pain] Pretty much all I can say is that it feels like there are about five people driving a knife in my wrist now. It’s not very comfortable, it’s not very enjoyable, but at the end of the day the victory has paid off. I’ll forget about the pain now, that’s for sure. The win takes away all the pain. For sure, if it wasn’t for this victory it wouldn’t have been as sweet, but at the end of the day I was just happy to make the finishing line. I didn’t think I was even going to be able to do that. I’m not the new boss of the rally, that’s for sure. There are so many guys that can win this race and we had strong competitors like Pablo and Ricky Brabec, Sam Sunderland, Matthias Walkner… everyone is strong. You can never count anybody out. Kevin Benavides did a great job and at the end of the day we all fight to the finish line and it’s been a hard rally. I just don’t like giving up, I don’t like quitting, that’s for sure. That’s about it. I love being out on my bike and I love riding and to be here with all the Dakar family and the KTM team it’s amazing. So, yeah, we’re pumped”. “It wasn’t easy. I worked hard before this Dakar. I was training all day, two times a day. I trained hard with the quad, hard with the GPS. I’m so happy to finish, so happy with the feeling I had on my quad, for the team, for the people of Argentina, happy for everything. For the rally [leading so much] is new for me. Before, every year I rode in super-cross, but last year I came to the Dakar for my first timeriding and first time finishing. I finished second and now I kept pushing, I wanted to finish in front. Now I’m number one in the quad and I’m so, so happy. [For next year] Now it’s too difficult to look ahead, but I spoke with my team and they pushed me every day, every stage. That podium is for my team and my family”. “It’s fantastic. No mistakes during the entire rally. It was a very, very difficult rally for everybody. The good thing was that from day three we were leading and we built on our time everyday until we came to the last day with a big, big lead. I’m really happy – thanks to Toyota, thanks to BF Goodrich tyres, all the sponsors, Qatar, Red Bull. It made everything happen right for this year. I’m happy for Toyota because it’s the first time in the history of Toyota that they won the Dakar, this is fantastic. [On being the favourite] It’s like what I always say, we respect all the other drivers. All the drivers are really very strong. Everybody wants to win the Dakar. But we felt when we came that in Peru, a 100% Peru rally, with no other country, there would be a lot of sand dunes, so we could do what we know we’re good at. We we’re leading from day three and, yeah, I’m really quite happy. [On avoiding mistakes that othersmade]This is the adventure of the rally. The rally is not easy and if you push every day, sure, you will have a problem with the car. I’m really happy to win this race with Toyota”. 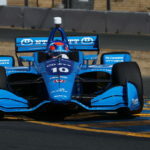 “It was a very difficult race. There were a lot of dunes, a lot of sand and very strong competitors, like my team-mates, Gerard de Rooy and Federico Villagra. Thank you for the race. I’m very happy. I’m happy with my crew, they worked perfectly. There were no problems apart from a small problem when we got stuck in the dunes, but our truck is a very good truck. My co-pilot coped with the task perfectly, so I am happy.